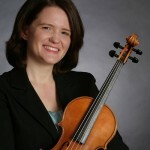 Laura received her Bachelor of Music degree with Honors in Violin Performance at the University of Illinois, Urbana-Champaign in 2003. She began musical studies with Suzuki violin lessons at the age of five in Great Britain. At age 6, after watching Nigel Kennedy play Vivaldi’s Four Seasons, Laura knew she would grow up to become a violinist. After moving back to the States, she continued violin in the Suzuki program at Southern Illinois University in Edwardsville and later with Dr. Lenora-Marya Anop. She was also blessed with other fine teachers such as Celina Bouldrey, Doug Locke and Peter Schaffer at the University of Illinois Champaign-Urbana. Laura is a Suzuki certified teacher in books one through ten. She completed her Suzuki pedagogy studies in books 1-10 in an intensive long term training program with Vera McCoy-Sulentic at SIUE as well additional training with Ed Sprunger, Carol Dallinger, and Alice Joy Lewis. 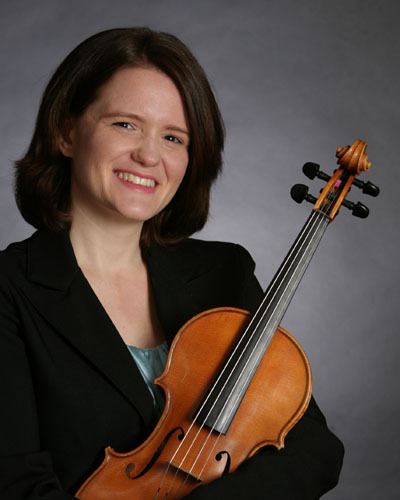 Laura is also certified in the Mark O’Connor Violin Method, having completed her training of books one and two in the inaugural training class with Pam Wiley and Sadie DeWall at the Mark O’Connor camp in Manhattan, New York in 2009. Laura continues to expand her teaching methods, attending workshops and teacher training courses regularly. As a performer, Laura has played with the Champaign-Urbana Symphony Orchestra and the Millikin-Decatur Symphony Orchestra. Besides her classical and pedagogy training, Laura has studied Baroque violin and was a member of the Baroque ensemble Concerto Urbano. Her recordings with this group are included in the discography of the Anthology of Baroque Music published by W.W. Norton. She also enjoys playing American and Celtic fiddle and loves to learn new styles of music! After running the St. Louis School of Music, a strings school with nine teachers, in addition to a full studio, Laura is very excited to be able to devote all of her attention to her own students and continuing to grow as a teacher. She maintains an active schedule teaching students age 3 and up. When she’s not teaching, she enjoys reading, scrapbooking, and spending time with her husband Dennis, son Devin, and her two quirky dogs, Arco and Harmony. Fundamentally, I believe that music is about self-expression. I want to help each student find his or her own unique voice and I hope to foster an environment in which students think for themselves and express their own musical ideas. In order to express this beauty each person has inside, students must develop really excellent technique. With good technique, students can CHOOSE how they wish a passage to sound rather than being limited by their abilities. Good technique opens many doors in musical expression and creativity and empowers students to further expand their ideas. I ask students to be very picky and detail oriented. I also emphasize the importance of effective and efficient practice methods, focused rather than mindless practice. I endevor to help students understand the principles of violin playing that enable consistently good results. I believe a student’s musical diet should be varied and stimulating. To provide this, I use the Suzuki curriculum which enables students to become familiar with beautiful classical works and helps facilitate the development of lovely tone, precision, and good technique. I also use the Mark O’Connor curriculum which fosters freedom, creativity, and individuality as well as the development of good technique through the study of American music styles such as fiddling and jazz.